Description: The property is situated in the village just 7 km from the market town of Dobrich, approx 42 km from sandy beach and 48 km from Varna airport. This is a recently renovated one-storay rural house. Located in a quiet and unspoilt village. The village is ecologically clean. There are great panoramic views. The area is very suitable for outdoor activities such as hiking, hunting and fishing. The property is just 300 m away from a big fishing lake. The house is one-storay bricks and stones made. 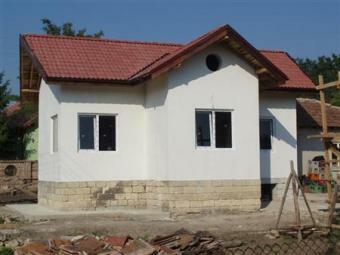 Rooms: 2 bedrooms, kitchen, dining-room, bathroom/toilet, cellar(12sq.m). The lovely home has two separate entrances. The property borders an asphalted road and is enclosed with a fence. Telephone line, Internet and cable TV are available. All essential services such as electricity and water supply are connected. There is convenient bus transport to Dobrich town. The village is well arranged offering blue skies and clean air. This is the ideal place to escape from the overpopulated resorts and enjoy the still untouched from the man nature in private. Don t miss this charming rural house !